I’ve added several photos of the Resolute desk with high resolution versions after getting a request for detailed images. Rod notes that JFK was apparently the only president to use the desk “wrong way around” with the plaque facing outward. It is, of course, a partner desk, so it is designed (without the kneehole modesty panel) to be used by two people at the same time, so it has drawers on both sides, concealed by doors. JFK must have had the modesty panel refitted so he could turn the desk around and the plaque could be read by visitors. The modesty panel was requested by FDR and added by Truman (after FDR’s death). I’ve had a request from a film set designer of more information on the devices in the West Wing that track the president’s movements. I hardly ever see them in photos, but someone sent me a picture a couple of years ago. I didn’t use it because I don’t document the security measures around the president, but if anyone has a photo or information about it, I’d appreciate it if you could send it to me. Also, I’ve added some more photos of the vice-president’s residence. Others have commented that they don’t think Joe Biden was talking about One Observatory Circle when he was explaining about the “bunker.” I now think he was describing the PEOC under the East Wing. That’s where Cheney went on 9/11; I recall a photo of him and Rice there. His dinnermates probably confused that with his description of the work room on the second floor of the VP residence. Regardless, I’m still certain there’s a bunker of some kind under 1OC. Neighbors don’t complain about blasting for nothing. I’ve added more than a dozen new photos, many of them from the late 19th century, filling out the exteriors a little. One thing they demonstrate is how often the layout of the north lawn plantings changed—every three or four years they were completely different. Also included are a few more early 20th-century West Wing pics, including a new one of the Telegraph Room in 1923. In it, the man standing appears to be the same man seated in the middle in the earlier photo. I like to think he got promoted and upgraded those awful shoes. I’ve also made the floor plans of the old West Wing into clickable maps, which allows you to get to the rooms quickly and also allows people to link directly to specific areas. Oh, and Pierce Brosnan got a VIP tour today. Yesterday, Joe Biden revealed that there is indeed a secure bunker built under the vice-president’s residence at 1 Observatory Circle. Astute observers will recall news reports of explosions in 2002 that irritated neighbors. I have at last added a page on the vice-president’s residence. Background checks work; pat downs next? Two students were taken into custody at the White House today when they arrived for a tour. Routine background checks on tourists uncovered immigration orders against them. Meanwhile, the daily press briefing was interrupted numerous times by journalists’ cell phones going off. I don’t know about you, but I turn off my phone for regular staff meetings; I can’t imagine taking a call in the middle of a televised WH briefing as Bill Plante did. I’ve added another big trove of photos from the Library of Congress, this time focused on the Executive Mansion in the Taft and Wilson eras. And we’re not talking the state floor; we’re talking bedrooms and nooks and crannies, including the old Butler’s Pantry and the old old Flower Shop. The Harris & Ewing photos are exceptionally high quality and have been digitized at extremely high resolution—just a spectacular treasure. You can just about read William Howard Taft’s accounts papers. And among his desk-side books was Brewer’s Dictionary of Phrase and Fable, a favorite of mine since I was a teenager. I’ve delved into my collection and the Library of Congress and created a new page to better illustrate the pre-FDR Executive Office Building, which became the West Wing. Peter Weil wrote to me with this better copy of an image I have of the White House telegraph room around 1906 asking for any more information anyone might have. 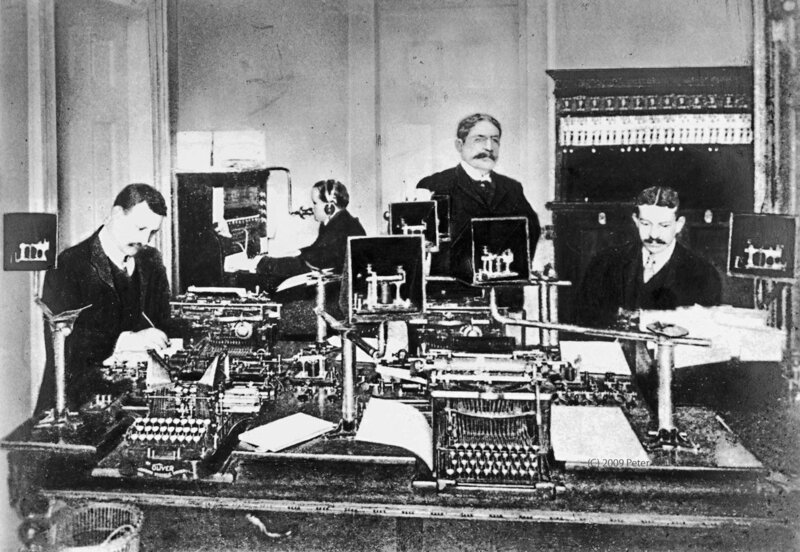 I believe it’s the Telegraph and Communications Office just off the Secretary’s Office and that the man at the back is operating an early telephone switchboard while the others work at telegraphs and/or early teletype machines. The regal central figure may be composited in, I think. If you’d like a history treat, download one or two of the high-resolution images from the Library of Congress and take a good look at the calendars, books on the desks, and so on. In this one, it is December 23, 1908, and one of the president’s assistants has been reading up on the tombs of Egyptian pharaohs. Of all the places under the American flag, next to the presidency itself, that of the President’s secretary would seem to be just about the jolliest and best. … If he has a world of tact, or a skin like that of a rhinoceros, or can lie like a thief and can grin with good nature when he is found out in his lies, he will probably enjoy the job.